NJS Safety Ltd are able to provide on-site qualitative face-fit testing service for your employees with a fully trained provider delivering the service. If you provide respiratory protective equipment (RPE) to your employees then it is essential that you have documentary evidence to show the RPE fits the wearer. 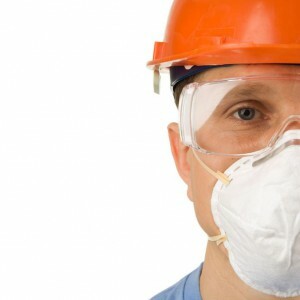 For many organisations this requirement has been overlooked which means that their employees may be at risk from exposure to hazardous dusts and vapours in their work environment because they simply do not know whether their respiratory protective equipment (RPE) is fitted properly. By subjecting each wearer to a face-fit test you can be sure that your organisation is fulfilling the requirements laid out in the Health & Safety Executives (HSE) guidance note HSE 282/28. The COSHH (Control of Substances Hazardous to Health) Regulations include a requirement that the initial selection process for all tight-fitting face pieces should include face-fit testing to ensure the wearer has a correctly fitting device. Face-Fit Testing is also required under both the Control of Asbestos Regulations 2012 AcoP L143 (paragraph 196) and the Control of Lead at Work Regulations 2002 ACoP L132 (paragraph 133). The HSE guidance note HSE 282/28 describes best practise regarding the fitment of RPE. The HSE information document 282/28 recommends that Fit Testing procedures should comprise a series of 7 exercises which should be performed for at least one minute each. The wearer must achieve an individual pass result in each of the 7 test exercises within one single testing period. ie if a single one of the exercises fails then the whole test must be repeated. The minimum time required to conduct one face-fit test to include purging and ambient sampling time is 20 minutes with additional time required for training users how to use their mask.